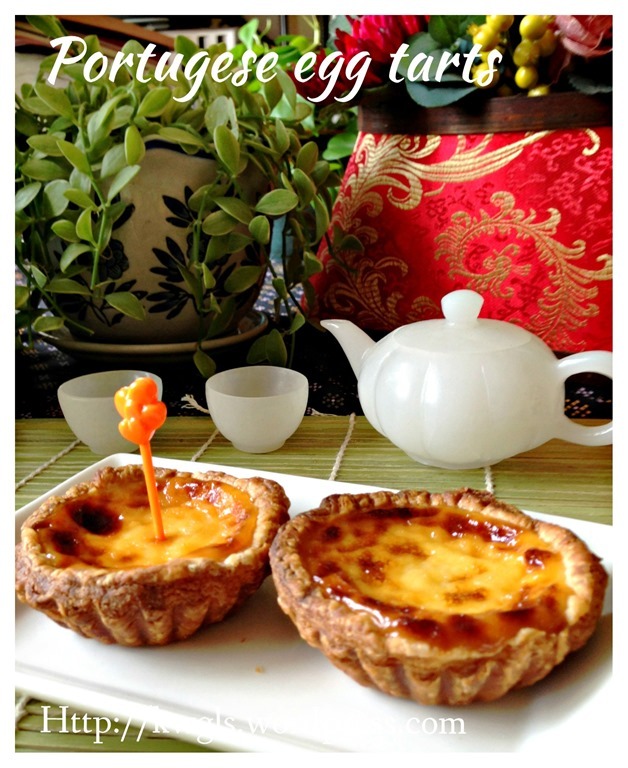 After the preparation of Hong Kong short crust pastry egg tarts, I thought it might be good that I tried out the infamous Portuguese egg tarts as well. 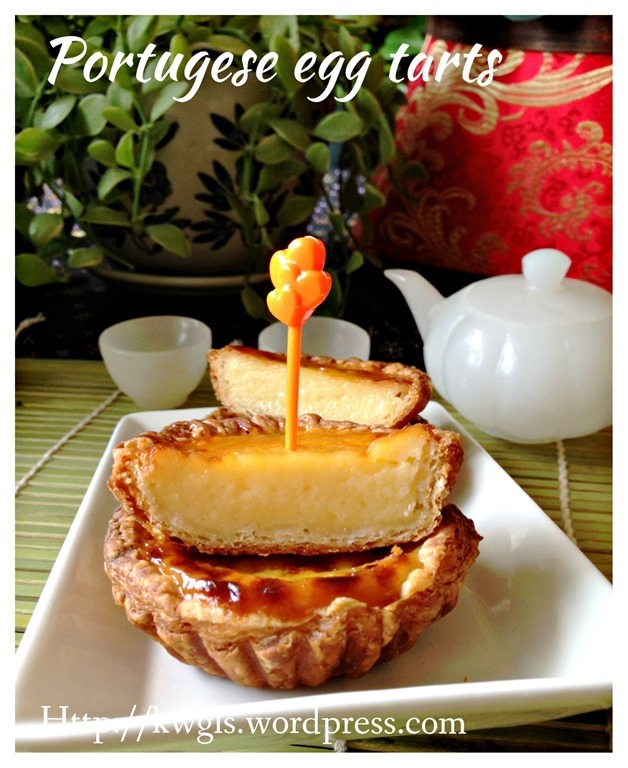 As in the case of the Hong Kong short crust pastry egg tarts, this is a custard tart but usually prepared using puff pastry. 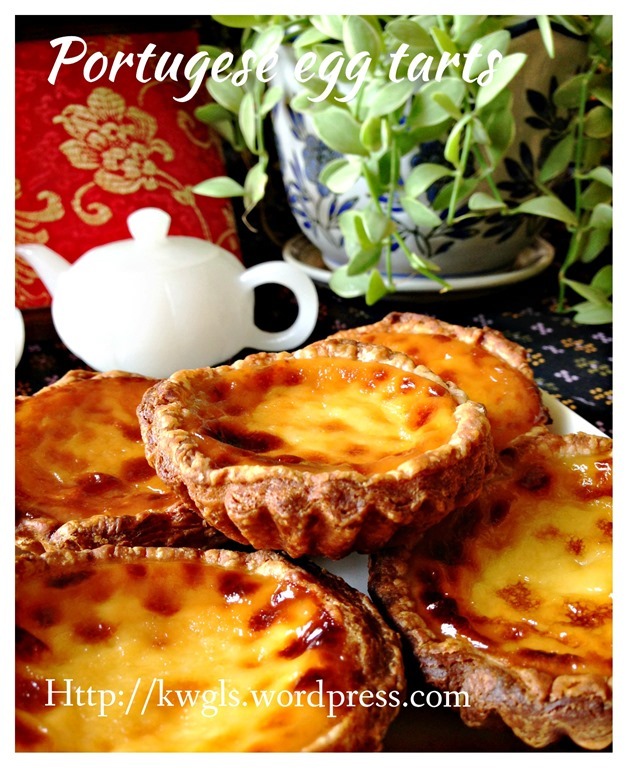 In order for commercial puff pastry to become crispy, it needs to be baked under high temperature. 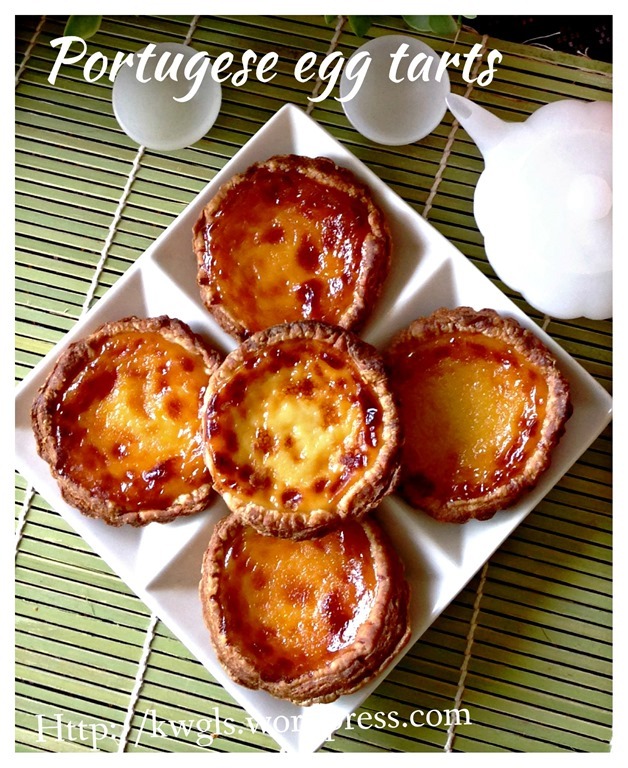 Resulted from baking under high temperature, the top part of the custard will appear to have black patches on top of the custard that create a distinction with other custard tarts. Divide the frozen puff pastry equally into 1o portions. 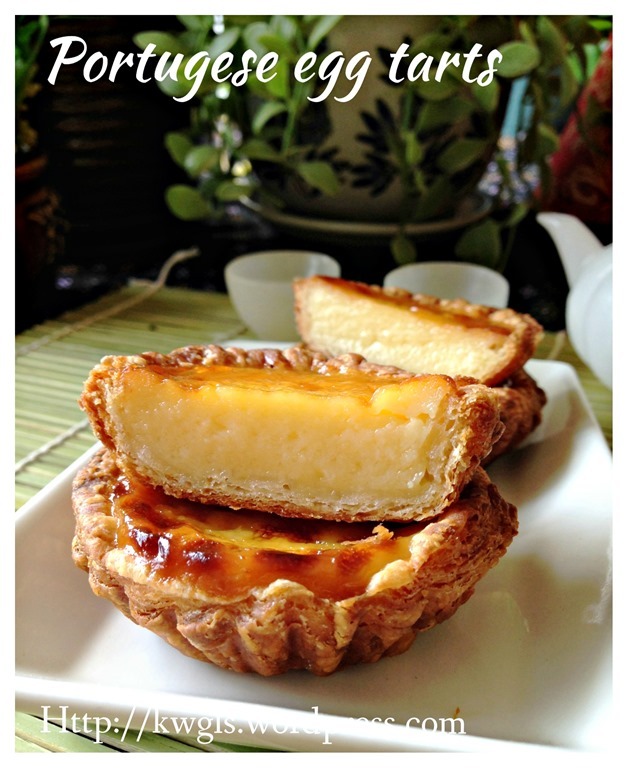 Place one portion on the tarts mould. Use your hand to press the dough against the sides and make it as even as possible. 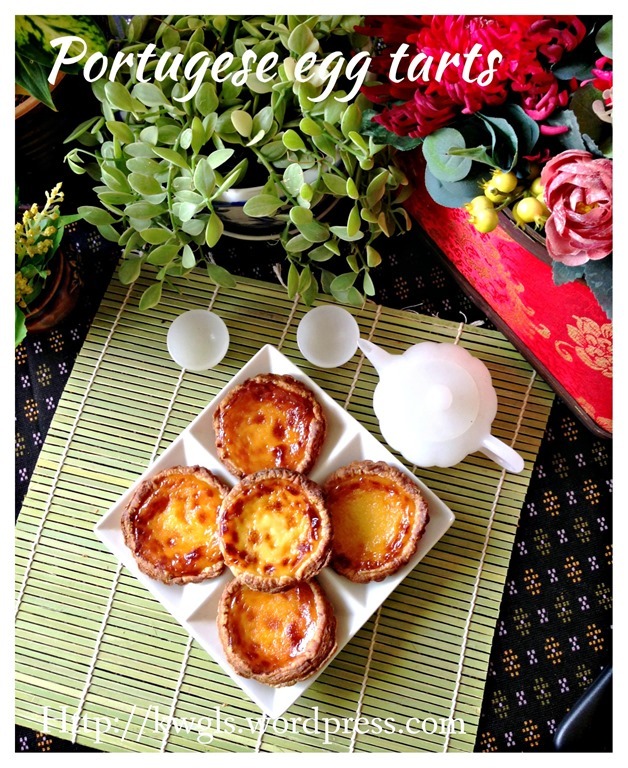 (In this illustration, I am using homemade puff pastry and if you are using commercial bought puff pastry, you can refer HERE on how to prepare the tart mould. 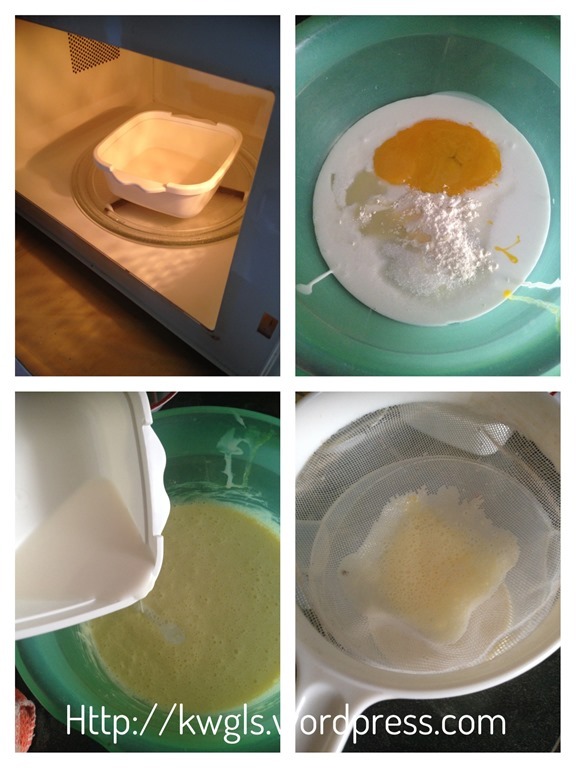 Heat the milk and sugar in a microwave until boiling (about 1-2 minutes). If you do not have microwave, you can heat the milk and sugar over the stove until the sugar dissolves and milk is boiling hot. 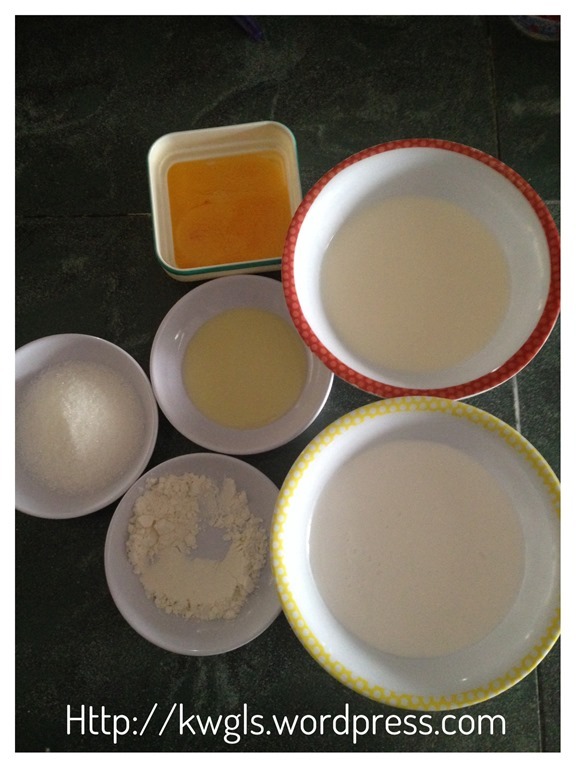 In another mixing bowl, put heavy cream, egg yolk, corn flour and condensed milk. Use a hand whisk to whisk until well combined. Pour the hot milk to the custard mixture, stir until well mixed. Sift the mixture into another container. 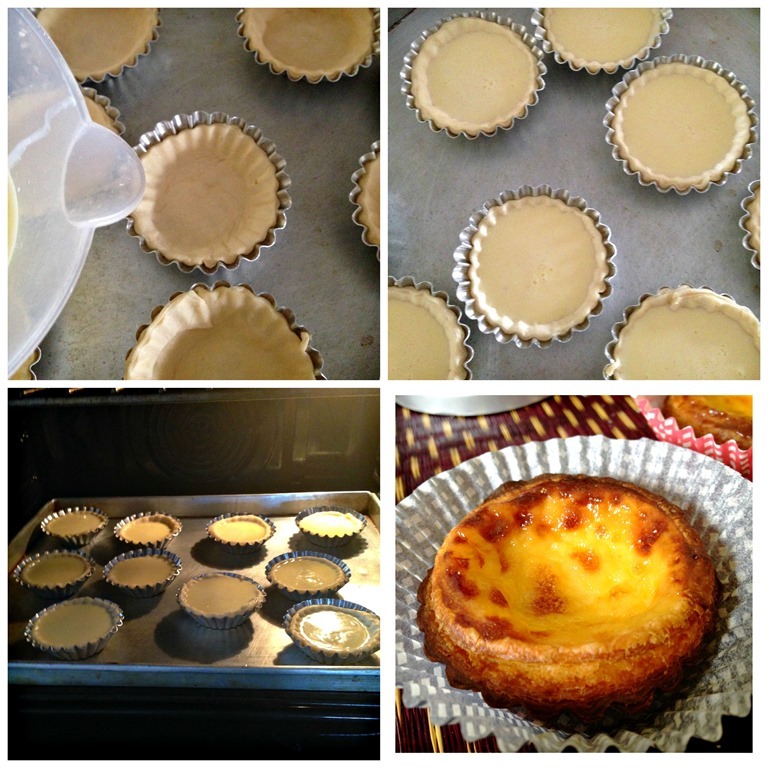 Pour the custard mixture to the puff pastry shells. 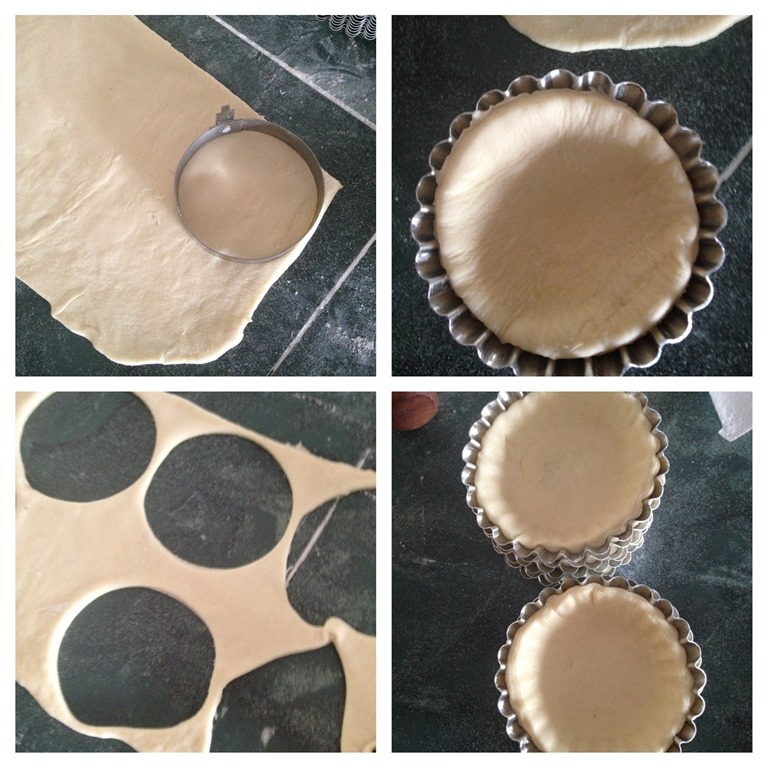 Place the puff pastry shells inside the pre-heated oven. Reduce the temperature to 200 degree Celsius. 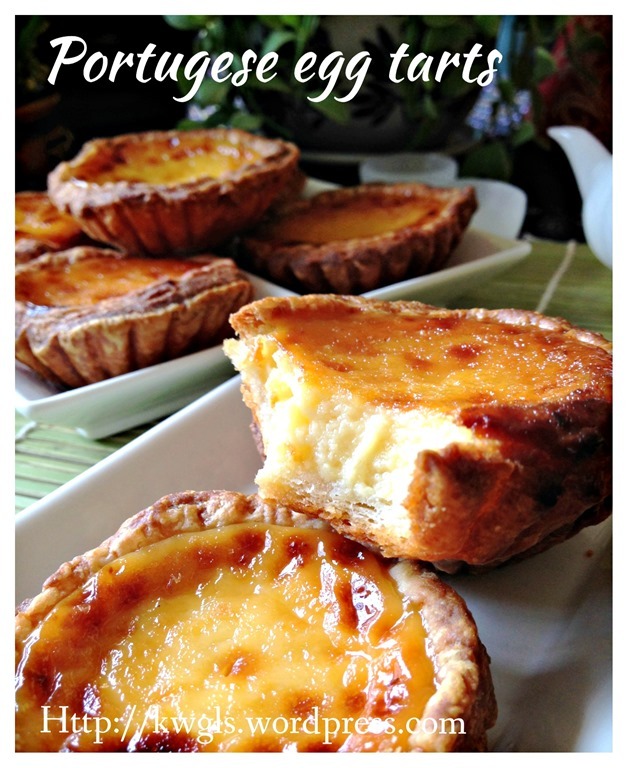 Bake the tarts for 20-25 minutes or until the custard is set. 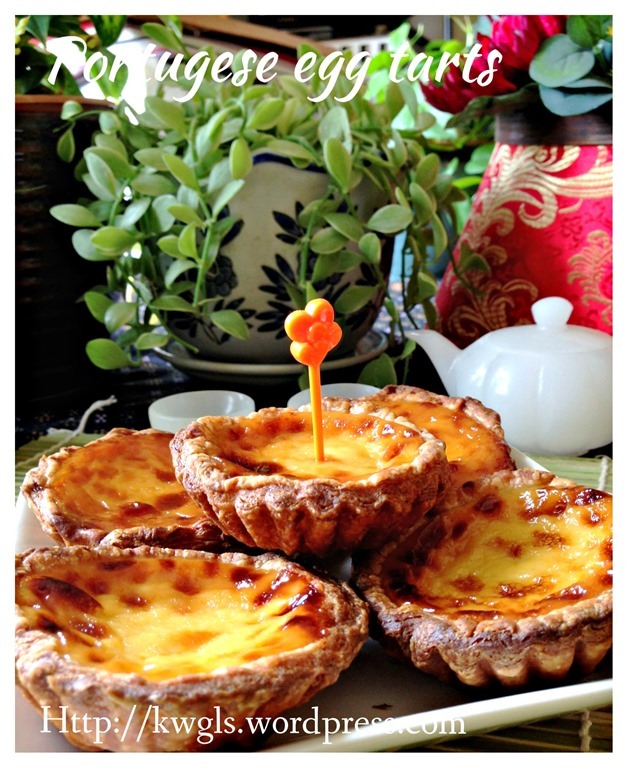 If you are using commercial puff pastry to prepare these Portuguese egg tarts, it is a rather simple bake. Do give it a try and let me know if it works for you. For more Chinese New Year related cookies, snack and steamed cake recipes, you can have a copy of “Easy Chinese New Year Recipes – A step by step guide” that was packed with 30 recipes, 60 pages at a reasonable convenience fee of USD3.50. 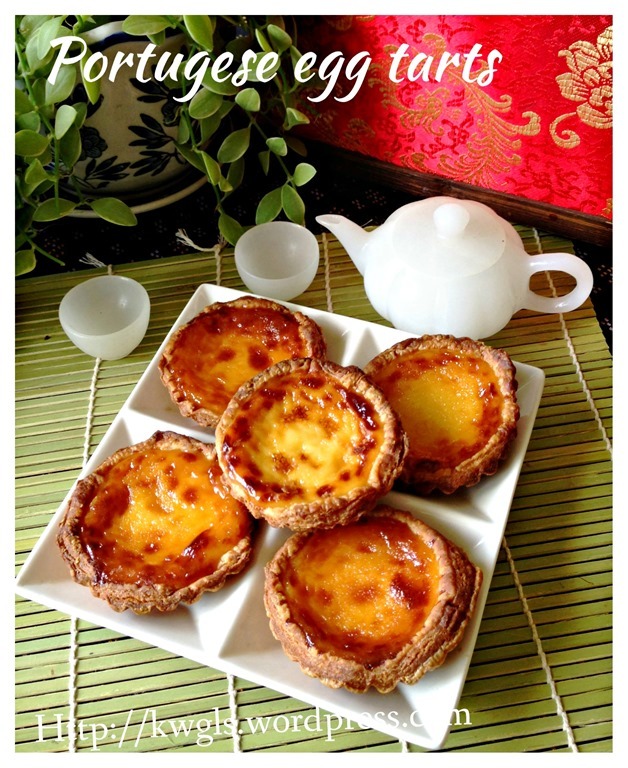 The recipes covered from auspicious radish cake to nian gao to traditional kuih bangkit to trendy London almond cookies. You can purchase by clicking the link above. You can either pay using Pay Pal or Credit card account. Please ensure that you have an PDF reader like Acrobat or iBooks in your mobile phone if you intended to read it in your ipad or mobile phone. 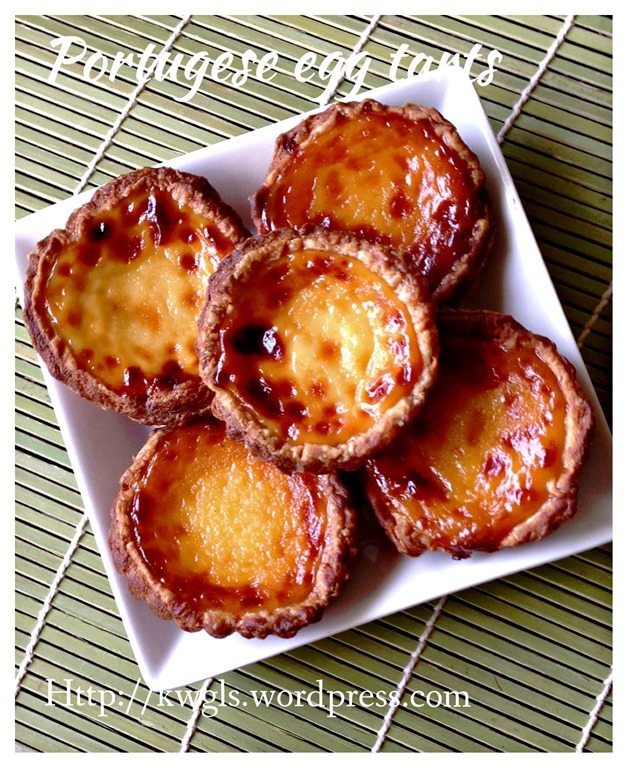 This entry was posted in Cakes and cookies, Chinese and Asian Cakes and Snacks, Desserts, Food Preparation Series and tagged 葡式蛋挞, GUAI SHU SHU, Guaishushu, kenneth goh, pastel de nata, portuguese egg tarts, postaday. Bookmark the permalink. I still prefer the crystal jade version. 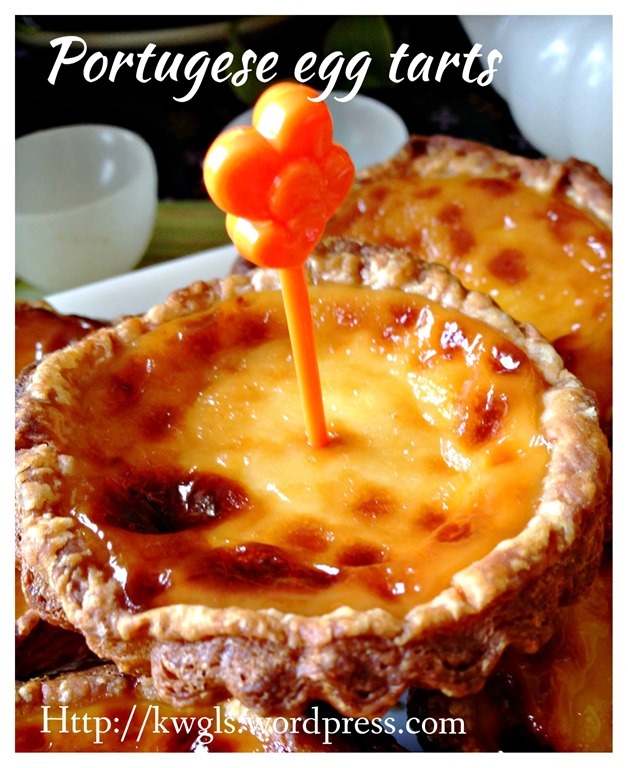 The Portuguese version is too rich for me. Kenneth, do you blind bake the pastry before adding the custard? Or do we pour the custard on to raw pastry?